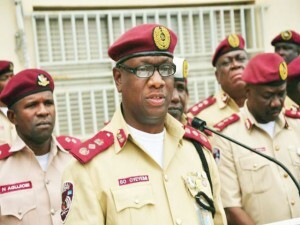 The Corps Marshal, Federal Road Safety Commission (FRSC), Dr. Boboye Oyeyemi, has announced plans to deploy cameras on patrol vehicles to track traffic offenders. He made the announcement while decorating newly promoted FRSC officials. He also said the new device would be installed on all FRSC’s patrol vans. “Worried by incessant knock-down of staff by “rogue motorists,” the FRSC has decided to push for stiffer penalties for offenders especially tanker and trailer drivers.“The corps would deploy cameras in its vehicles to enable water tight prosecution of road traffic offenders. The Volkswagen Gulf and Opel Vectra commercial vehicle operators would also be in closer focus this year because their activities have become a negative narrative in the road sector,” he said. Finally, he announced the establishment of 20 commands in 2017 and stated that the FRSC had secured the approval of President Muhammadu Buhari to improve their logistics and recruit more personnel.